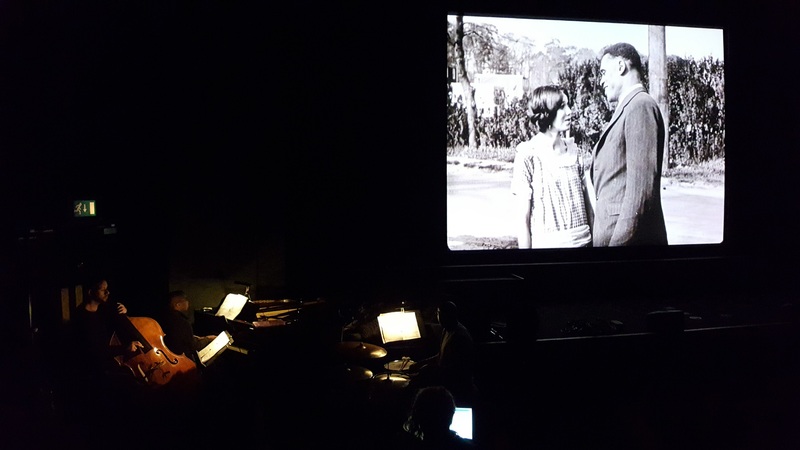 Here’s a great review from journalist and broadcaster, Kevin Le Gendre for the NCO Ensemble‘s sold out world premiere of maestro Peter Edwards‘ new score for Body And Soul at the National Film Theatre, London on 5 December. Sound and image are in symbiosis. Mood on screen and atmosphere in the auditorium are expertly matched. The essence of the story and the content of the characters are relayed by the skill of the composing and improvising. The trio of pianist Edwards, drummer Rod Youngs and double bassist Alex Davis form what is the scaled-down ensemble of the Nu Civilisation Orchestra, and play a set that vividly reinforces and enriches the 1925 silent movie. It has a cast headed by the iconic Paul Robeson, which is all the more interesting for his role against type as the dastardly ‘faker’ preacher Jenkins, an ex-con who preys on members of a naïve congregation in the Deep South, to the detriment of his virtuous brother. The portrayal of the ‘evil twin’ is gripping for the immense charisma Robeson exudes by way of an acting style that is mostly naturalistic, and Edwards plays a trump card with pieces that are subtle rather than excessively dramatic. His main vocabulary nestles between Ellingtonian nobility and a hearty New Orleans swing in which the crispness of Youngs’ snare and Davis’ concise quarter notes skillfully create the momentum to support the flow of the narrative.